I’m going way back again. I’m probably doing a very good job of mixing up “time line.. but my memories don’t come in time line form. When I was three we moved to 6075 Angus Drive, to a house that dad had had built for us. It was on a half acre lot at the corner of 45th and Angus. We lived there until after the crash of 29. when we moved to the Cariboo. Our next door neighbour on the 45th side was Dr. and Mrs Oliver Leslie. He was a dentist, .. she was a homemaker. Anna Leslie. They had no children, so kind of adopted neighbourhood kids to swing on their cherry tree when they were sitting out in the garden! They had 5 dogs… Goldie Leslie, a cocker spaniel, who was allowed in the house. They had four black Labs, with a large kennel in the yard. They were allowed to play in the yard when people were sitting out there, but were well looked after in the kennel. Anna was an avid gardener, and would often transplant during a rain storm, then go and take a mustard bath so she didn’t catch cold. They had a beautiful home. She even did re upholstering herself. When they knew that we would be moving away, they took me out for dinner. A very rare occasion in my life. I still vividly remember what I wore.. a lilac coloured taffeta dress, white socks and black patent leather shoes! I felt so elegant, and so grown up! When my three sons were little, each Christmas we would visit Mrs. Leslie to deliver some of my home made cookies. She was one of the influences in my growing up, and I thank her for that. Lena and Al had the only electric lights for miles around… even in the barn!. 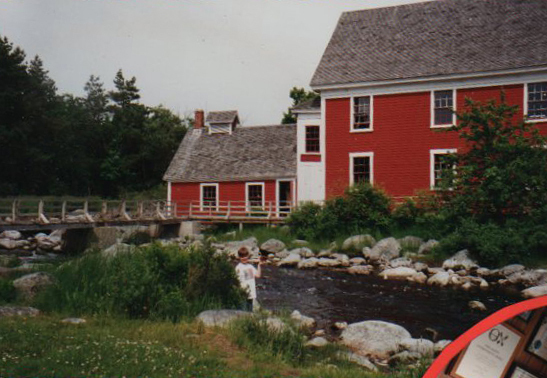 Al had a delco system and had the creek diverted with a water wheel that he used to charge the batteries. It seemed to me that Al could do anything… and he could! He had a complete irrigation system set up… just by moving a few rocks he’d change the course of the creek and water the garden or the meadow. The creek also ran through the pasture and the corral in front of the barn to water stock that happened to be in there. The ones out on the range would periodically head home and into the big corral for the salt block. This gave Al a chance to see that they were in good condition. Their house was one main room, kitchen and sitting room together, a large pantry and a bedroom on the main floor. Very steep steps to the upstairs where it was divided into two bedrooms.. You had to go through the one at the top of the stairs to get to the other one. I slept up there, in a feather bed! That was really great, but you had to fluff it up every day when you made the bed. There was a covered over porch with a washing machine out there. They had this great root cellar. It was dug into the side of the hill and the roof was all sodded over. It kept really cool in the summer and kept the vegetables from freezing in the winter. There were big bins full of vegetables in the fall, but by the time winter was over and fresh produce was available from the garden, the supply in the root house had dwindled considerably. They had a grainery for storing wheat, etc.. They also used it to store case lots of canned goods that Al brought in from Williams Lake…. Enough to last them through the winter. There was a garage of sorts added to the side of the grainery. The last summer I spent with them was when I was fourteen.., and Allan, Lena’s second child, was just three months old. I don’t remember why it was the last time… maybe Mom and dad needed me at home… maybe Lena just had too much to do after the kids started coming. Anyway, it was a very special part of my life, and I am ever grateful to Lena and Al for their kindness to me. They had three children, Elsie, Allan and Leslie. I’m including photos of hem, taken many years ago. During haying season I drove a team of horses and did all the raking, and once all the stooks were picked up, I reraked it all again. I also drove a team hauling a “slip”… it was like a sled with a sling down the center. The crew would load the hay on it, then throw me up on top, and I’d drive it to the barn or the stack. I would unhook the team from the slip, hook them up to another line, which would haul the load up and over to where it was to land, then I would “trip” the load, hook the team up to the slip once more, and back to the meadow for another load. I was a necessary part of the hay crew and I loved every minute of it! One summer, working out in the hot sun all day, I ended up with sun stroke and had to stay in the house. I didn’t feel very good, made even worse because I couldn’t help finish up the haying and share in the great feeling of a job well done and finished. When I was in the house I helped Lena. 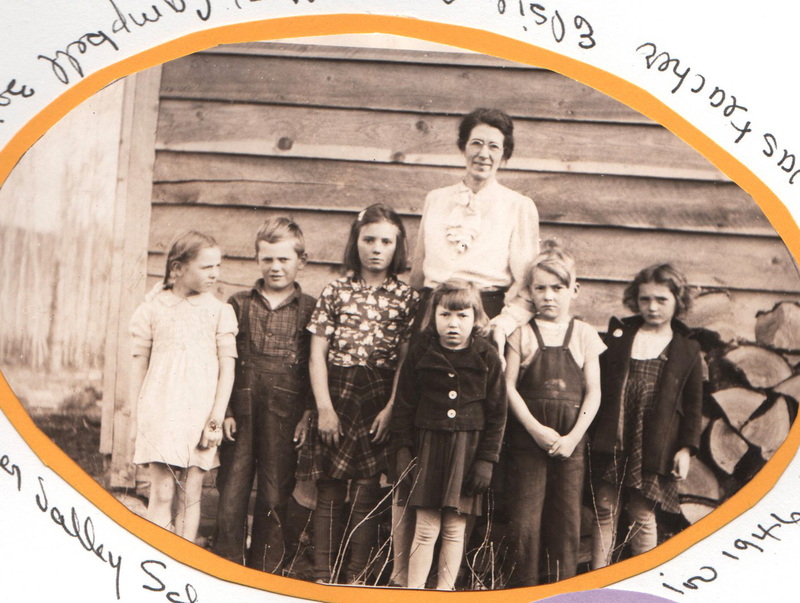 She cooked three large meals every day, but even more so with a hay crew working. She had to make their bread, and there was always delicious desserts… like raisin pie with whipped cream….She a made stacks of pancakes every morning. She also grew a large garden to supply their vegetables… that meant weeding and hoeing as well, very time consuming jobs. The hay had been raked, and put into small stacks, Now they were to be loaded onto the slip that I was driving. The two guys were each supposed to put their fork into it, one on each side, and lift it together and add it to the load. Loyal was just about useless… in fact, he made it worse for Anderson to get the job done… He lifted Loyal up and sat him down off to the side and loaded the hay on by himself! Then he picked me up and threw me up on top of the load so I could drive the team to the barn. I can see both of them, plain as day, but his first name escapes me. One year when I was reraking the hay…way over from the house… right up against where the bush and trees had taken over…… Well, my team of horses hit a hornet’s nest and they took off running, heading for the barn. I was pulling back on the reins as hard as I could, but no way was I able to stop them. That was one wild ride! Luckily the hornets liked the horses and never bothered coming after me! We used to go fishing up at the lake behind their place. Al loaded an Evinrude engine on a horse’s back and we hiked up the hill all the way to the lake. 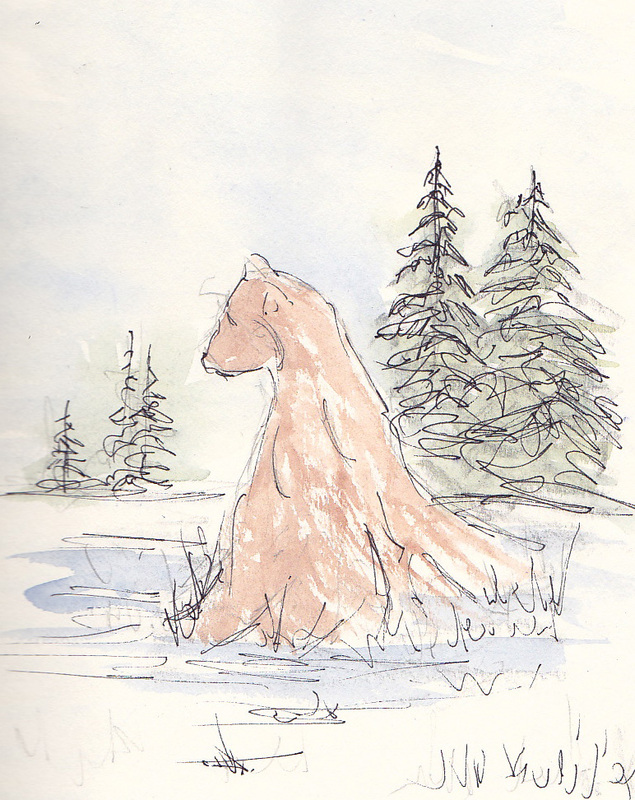 I don’t remember if the “Lake” had a name, or not. Anyway, the engine got attached to a raft and the three of us started fishing. If we got one on the hook, Al would speed up the engine, and we more or less drowned the fish! Often, all three of us would have a fish on our hook at the same time. As Al only had one hand, Lena had to pull them in…then we would pull into shore, build a fire and BBQ some fish for our lunch! I’m jumping around again… please bear with me. One time Al figured a cow out on the range should have calved. So we went looking for her and found her and the calf, along with twenty or thirty head of cattle on Smith Flats…two miles from home. We couldn’t seem to get the cows headed home… Al was riding a skittish colt. Al got me to get off of King and put a noose around the calf’s neck. I went to get back on my horse and went right over him and landed on the ground on the opposite side of the horse. I sure was embarrassed, and felt very stupid. Anyway, I attached the loose end of the rope to my saddle horn, and Al said ”to take off running,” and drag the calf a short distance and then the cow would follow us home. I gave King a good kick in the sides and he took off… but as the rope tightened up it almost took me out of the saddle. I managed to stay seated, leaning well over to the left, and the calf bawled. Al then lifted the calf and laid it across my legs, and we headed for home with all the cows trailing behind. As they say, there is more than one way of skinning a cat. 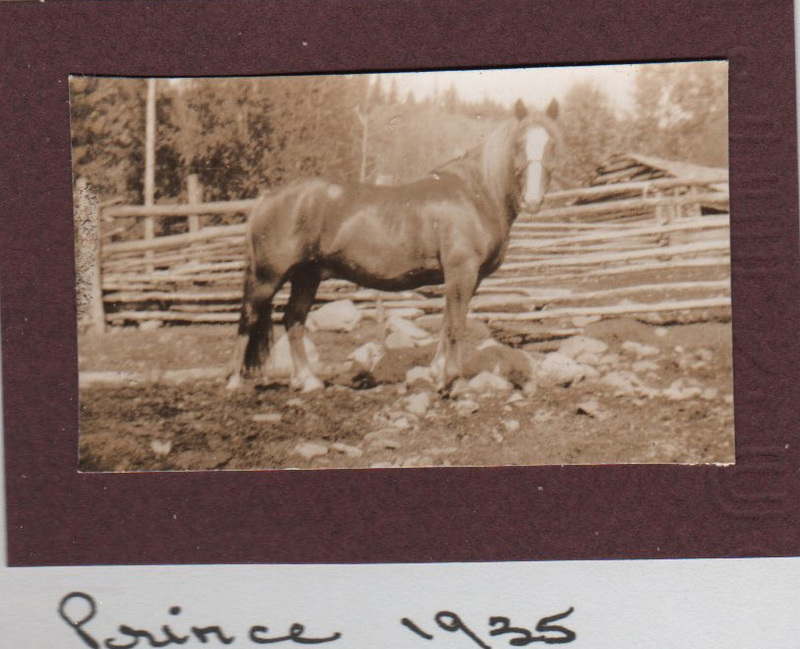 I remember another time when Prince, a beautiful sorrel horse had a fistula (lump) the size of a football on his front shoulder, and Al had to open it up…so before breakfast he said “Come on Norma, you can hold him for me.” It started out just fine, and Prince was tied to the fence…. I was just holding his halter to steady him. Al cut into the lump, gook spurted out… and the ground came up and hit me! And Al had to leave me laying there until he finished what he was doing. That was the first time I ever fainted! I got teased for some time after that. 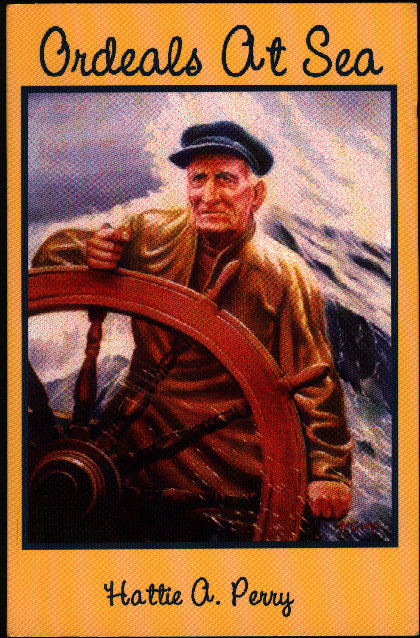 I don’t remember at what stage of our lives, but somewhere along about this time, Dad got a job as a longshoreman. He had to be around 60 years old, and was the oldest man on the crew. He was given the name of “dad” from the rest of the crew. It was rather a dangerous job as the regular longshoremen were on strike, and this crew were considered scabs….. I remember that dad carried a piece of pipe wrapped in newspaper, for protection, just in case. I’m pretty sure that it was when we lived on East Boulevard. Bob Barrager was one of the crew that dad worked with. He and his wife and Lawrence, their small son, lived in the Pacific Hotel downtown… no place to raise a family. They remained friends for many years. He and dad loved to play crib. Here I go… jumping off in a different direction as my memories flood back and tell me where this “story” should go! Bear with me, please! 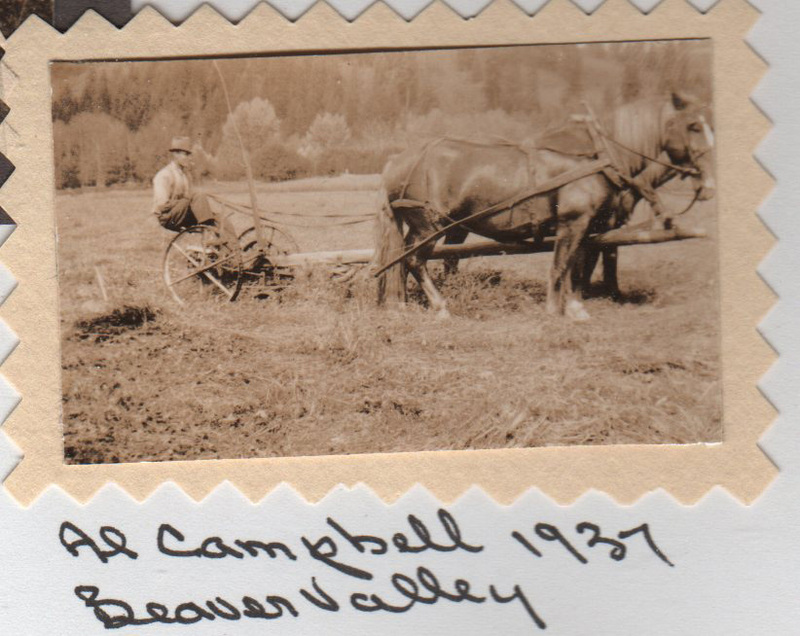 When we moved back to Vancouver, I spent a few summers with Lena and Al on their ranch in Beaver Valley. Dad would put an ad in the paper lookmg for anyone who needed a ride to the area, and they would help pay for the gas. One year I went with someone else, and helped pay for their gas! That time Al was to meet me at the 153 Mile house, Crossinos. We had a couple of flat tires along the way so we were late getting there, and Al had to leave before we arrived. Cows had to be milked (by hand), and all the chores of the ranch had to be done. 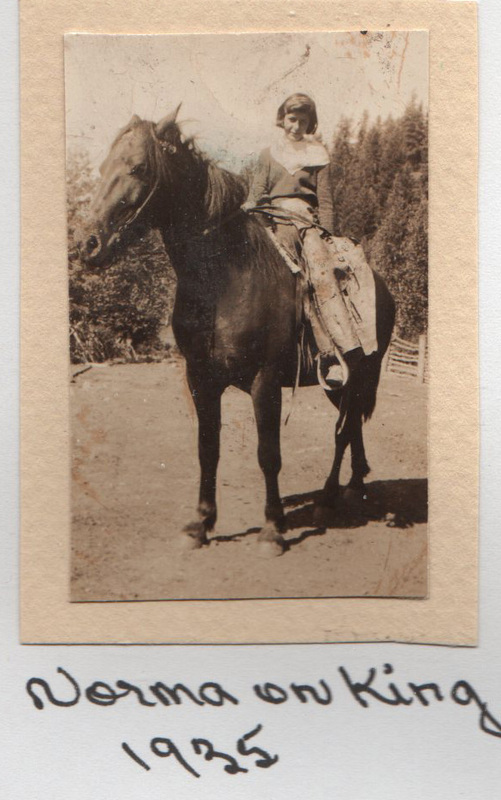 I was to stay there overnight, then ride to Horsefly with Eddy Kenvick who delivered mail to Horsefly once a week. 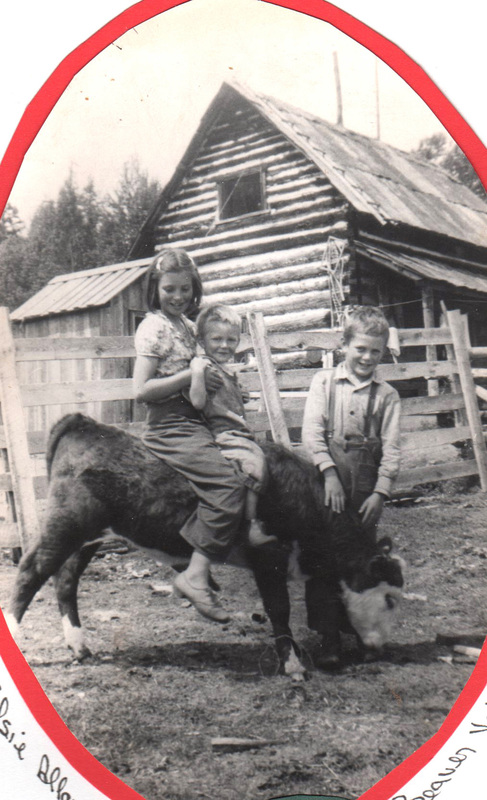 We arrived in Horsefly in the late afternoon, and there was another message from Al… I was to stay overnight at the “Corner House” with Parminters. Al picked me up the next day. Quite an experience for me as I was only 13. While they were changing tires… yes, we had more than one flat tire on that trip…we had to sit around in the grass. I guess I made a bee mad at me and it stung me on the neck, just behind my ear. It really swelled up and I didn’t feel very good for a while, but eventually the swelling disappeared before we got to the 153 Mile House. 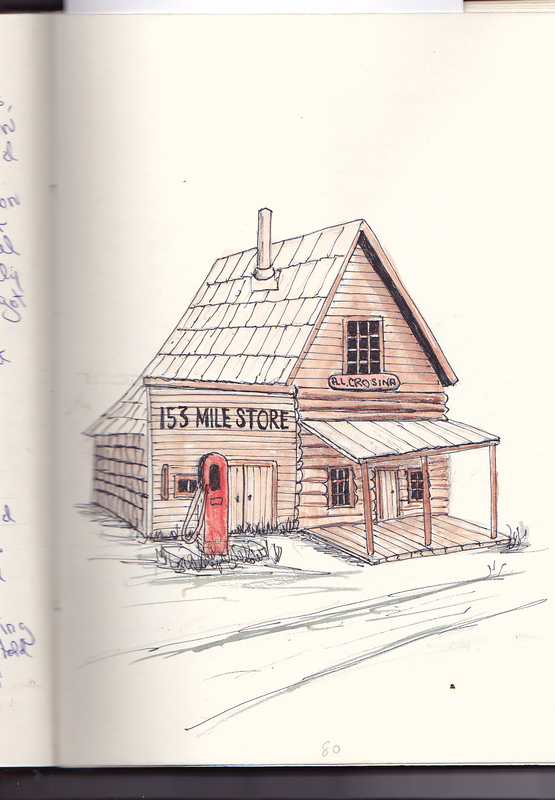 The Crossinos had the little store at 153 Mile House where they sold “everything. ” I think that was the first time I ever spent the night in someone else’s home. In the bedroom there was a ceramic wash basin and a pitcher of cold water to wash with. Those summers I spent with Lena and Al were very precious to me. Here I go, jumping back in time again! The Christmas that my brothers had the Christmas tree stand was about the time of my greatest desire for a present! I wanted a pair of ice skates, but I didn’t think there was any chance of getting them because money was pretty scarce. Imagine my surprise when I got two pair of skates! Both used… both boys skates! A dear friend of my dad’s, Kay Charles, and Armenian shoe repairer,… he gave me the second pair. We used to go skating out at the Exhibition grounds. I can’t remember who I went with, but I know I was not alone.. The only problem was that I had weak ankles, and with boys skates, there was no ankle supports. So… I didn’t become a famous skater, but we did have fun. 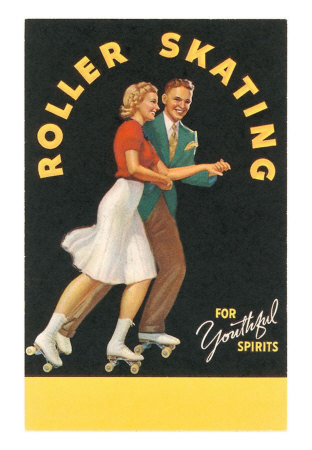 We used to go to the roller rink, too. And that was fun skating around to beautiful organ music. As long as you went with the flow you were all right, but there was usually quite a traffic jam. My memory just kicked in… out of time line…when I was at Point Grey Junior High I joined the pen and ink club…. then years later I was doing pen and ink drawings. Thought you should know that, even out of context! Around about this time (1938) Boy, I’m using that phrase a lot! We moved again… to 70th and Granville. 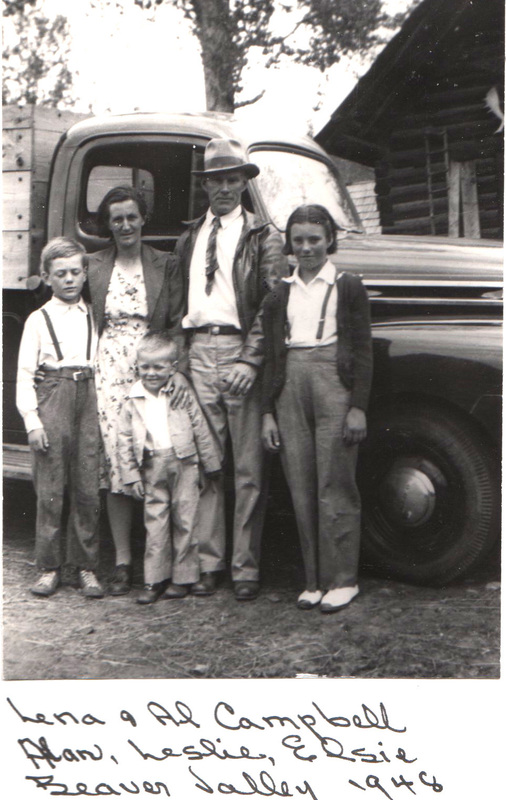 I went to the Open Door Baptist Church along with Ethel Trefry and two of her three brothers, Delbert and Aubrey. (Wendell was older). I went around with Aubrey a bit but nothing serious. ( so “not so serious”, I’m not sure if it was Aubrey or Delbert.) Have a feeling it might have been Delbert! A group of young people from the church were the ones I went skating with…. And we had corn roasts on the banks of the Fraser River . This was in the Marpole area of Vancouver. We played Hide and Seek in the bush of a vacant lot near where Trefrys lived. Or played baseball, or sat around in Trefreys house, either playing cards or just talking. I was 15. Their front room was small and was “off limits” even to them, unless they had very special company. They had a large dining room with a couch in there, and that’s where we “hung out.” It was a bit weird for me as our living room was just that… we lived in it every day, not just when there was company. 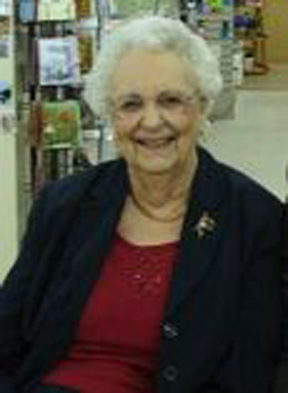 Isabel Taylor was another one of the group, and we used to play cards at her house some times. One of her brothers had epilepsy and had one of his seizures when we were there. That’s very scary the first time that happens in front of you. 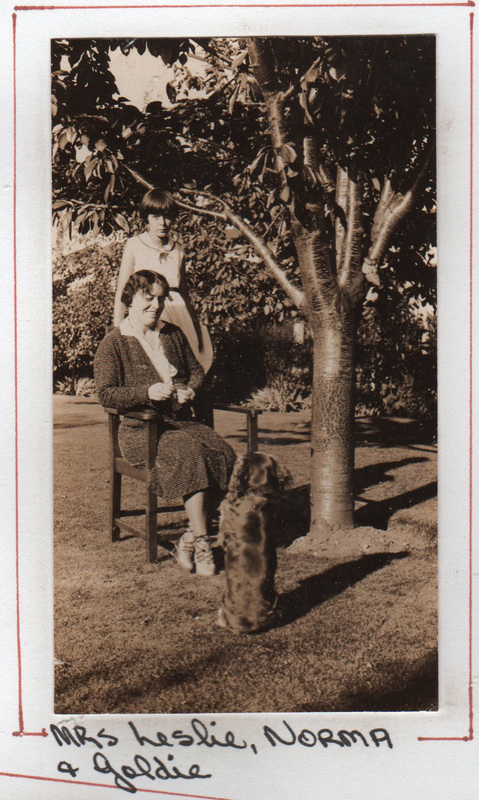 Ethel, Isabel and I were known as the Three Musketeers. Solvik Kendrick and her sister, and James Holt were also in the young peoples group at the Church. Jimmy’s mother had this wonderful aura that shone about her. I can still see her face… it was like she had a light shining from the inside! Baptism at that church was by dunking. I just about got up enough nerve to go through it, but I chickened out.